We only get a very small number of these per year. 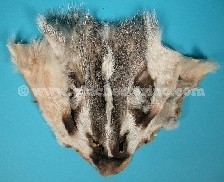 The select badger faces are extremely rare and have no defects. They lie flatter than the other grades. The #1/#2 badger faces are decent quality faces with few or minor imperfections. The #3 faces have some tears, bullet holes, rips, or hair slips. The Reject faces are badly damaged (e.g., half a face). Genus and species: Taxidea taxus (North American badger). Wild.